Lucario proves once again just how powerful her legs can be, leaping over Renamon's impressive 4km bound to take home another Gold for 4.3km right into the heart of Moscow! Her lead is now extended to two Games over Renamon, 12-10! 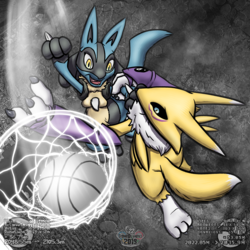 Renamon still commands 735.6m over Lucario though! It's now 2989m to 2253.4m, just a hair shy of 3km for him and quite a mess for any civilization in their path!